No flower or plant heralds the season as much as the poinsettia, with its colorful bracts and luscious showiness. 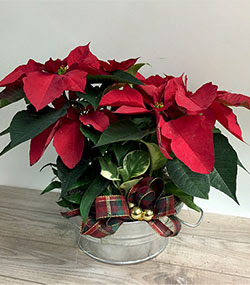 You might be surprised to learn that the glorious poinsettia is actually a weed! It was discovered in Mexico in the early 1800s by a man named Joel Roberts Poinsett, who was the first US Ambassador to Mexico. He also helped found the Smithsonian Institute, but is best known for the gorgeous plant (weed?) that bears his name. Our next door neighbor, California, grows about 6,000,000 points every year. And while it feels like we go through half of that amount ourselves every Christmas at Cactus Flower Florists, that's probably an exaggeration! However, it does mean that our points are freshy-fresh and perfect for the holidays. *Do not place the plant where it will receive hot or cold extremes. Keep away from vents, fireplaces and outer doors that allow cold drafts inside. *Do not place in direct sunlight. *The plants prefer cool (65-70 degrees) rooms. *Keep the soil damp, not wet. Make sure excess drains out when watering, and do not allow the plant to sit in water. *Take care when handling. The top-heavy, showy bracts damage easily. It's best to find a good spot in your home and leave it there! * After the holidays are over, keep in a cool (45-50 degrees) brightly lit location. Since most of us do not keep our homes that cool, and since most of us don't have basements, the best spot would be in an unheated garage that has a window. *If you have such a location, and the plant makes it through the winter, cut it back to about 3 to 4 inches in the early spring. Repot in fresh soil and move it to an area with strong (but not direct) sunlight. As new growth appears, cut back the tips, which will cause the plant to progress in a bushy (rather than spindly) manner. *If the point makes until next fall, congratulations! Starting in early October, keep the plant in a cool dark room from 5pm until 8am. This creates a short day for the plant, which gives it the signal to throw off the showy bracts. With diligence and luck, it will start blooming again early-mid December.